Believe Dream Create with Maria: A BIG Fat Colorburst and Stencil Beautiful MESS! A BIG Fat Colorburst and Stencil Beautiful MESS! 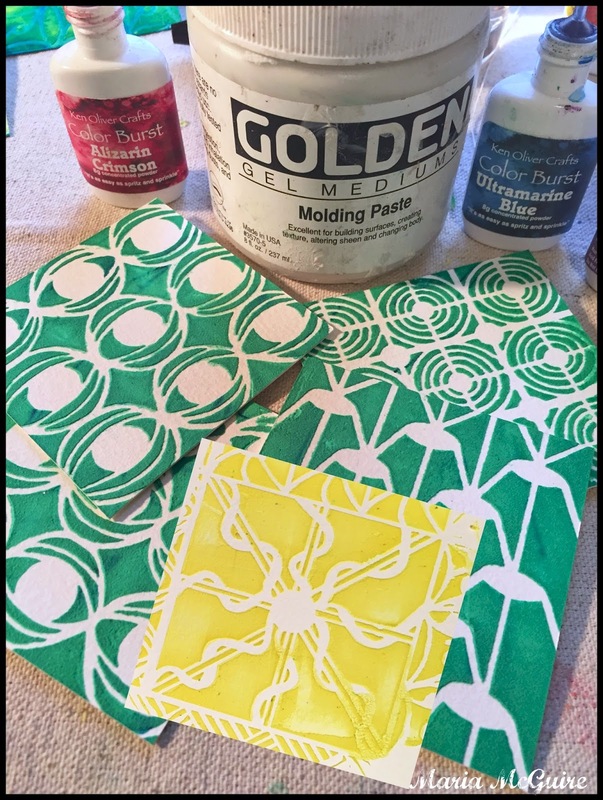 Welcome to the StencilGirl and Ken Oliver Blog Hop! Where to begin........oh did I have fun with Ken's products!!!! I started thinking I would sit down for a minute to play and then a few hours later this is what my desk that was empty when I started looked like! 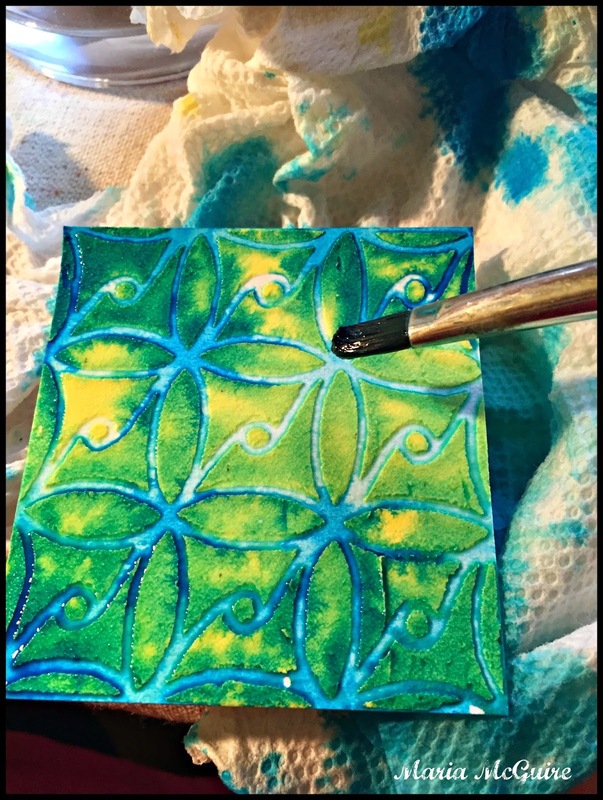 Needless to say...I have a "few" ideas on how to use Color Burst with stencils :) Let's start with this one.....why I decided to do this I have NO idea...but I am SO SO SO glad I did!!!!! 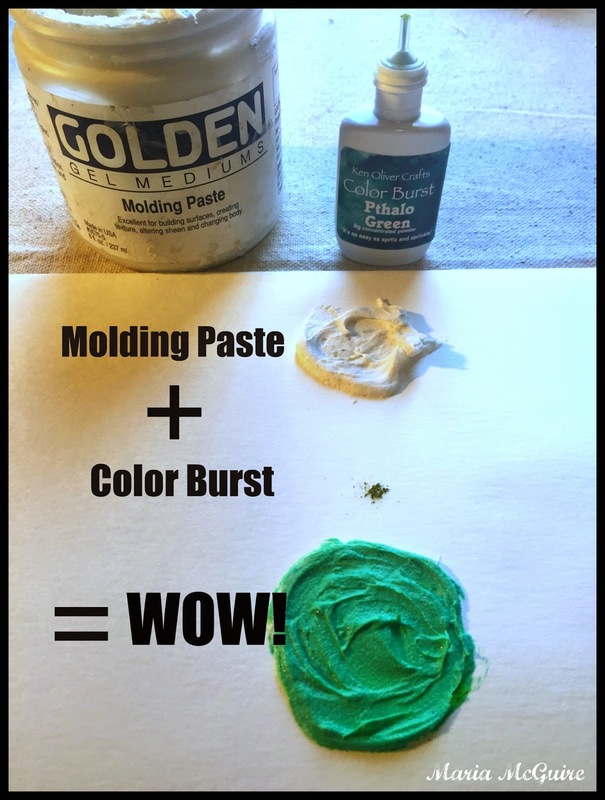 A touch of Color Burst into Golden Molding Paste--OH MY! As you can see in the photo above and below...I had to try out my new Molding Paste with a stencil. 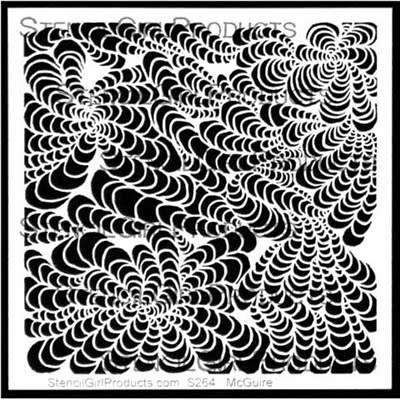 I used my Doodle It Tornado Flowers to test it. 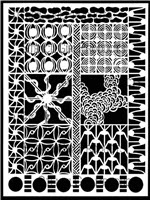 After I had the Molding paste, I used my Doodle It Bigger stencil to make some small pieces to play with. I don't know what possessed me to dunk the entire piece in water....but it worked so I won't question it. You can also see that I was using the top of my Molding Paste as a palette....very in the "moment". After it was wet I used a bit of the Color Burst mixed with water to color my piece--switching colors from time to time. I LOVE how it oozed into the Molding Paste. Okay....now lets talk about that Click It stamp pad!!!!! Mr. Oliver where oh where were you went I was an avid scrapbooking INKING QUEEN!!!!???? GOODNESS, you need to get yourselves one (ALL) of these!!!! In LOVE!!! After I my mini pieces were done, I ran the ink pad over each one....why, I have no idea...but I LOVED what it did to them!!! Seriously, this ink pad is AWESOME!!!!! I also showed above a little sample I did to just try them with a hand carved stamp. Here is a close up after one was inked. So....what to do with mini masterpieces :) Make pieces of art of course! I mounted each piece on a piece of foam core and cut around it with an X-acto Knife. Then I used two Bass Wood Canvases from Walnut Hallow as my base. I painted them black and did the edging with gold. Perfect place to mount my works of art. I added some gold lines as an accent and they were done. Easy! As you can see...I had "a little" fun with Ken's products and stencils!! As a matter of fact, I will be back in the hop on Friday with another project! See you then....but before you go, make sure to leave a comment (hopefully about my projects) to be entered to win the StencilGirl GIVEAWAY! These are so pretty. I love how they turned out. Sometimes just doing things to do them help us learn alot and new techniques too. thanks for the inspiration. 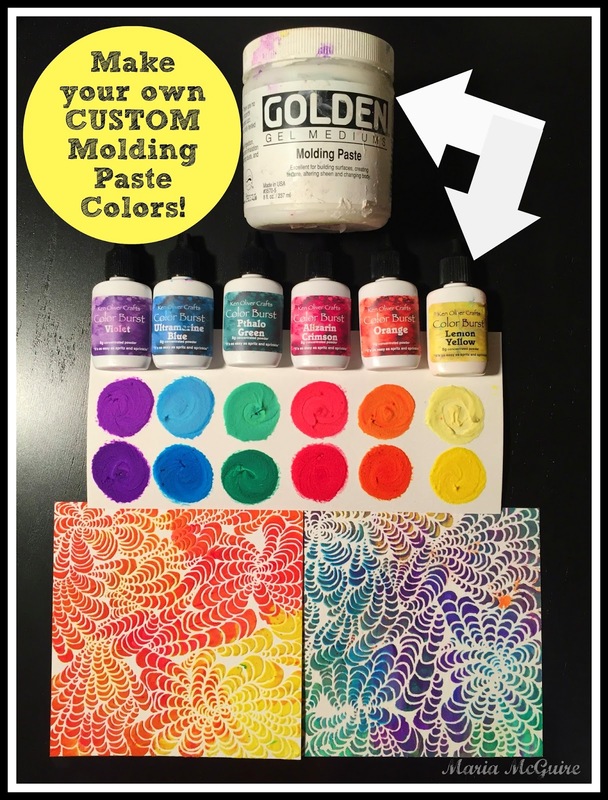 Love the Paste coloring idea! Very Colorful. 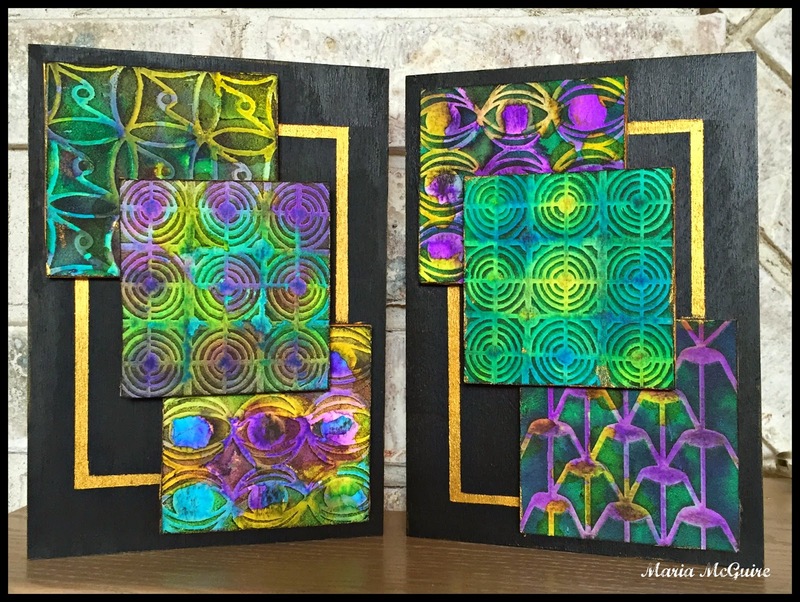 I think the possibilities are endless with these color bursts, especially when combining them with your beautiful stencils! The results you achieved with the colored pastes are stunning!! Wow! Love seeing the process of all your colors and FUN and layers, Maria! What great ideas. It looks like no matter what you do with color burst it is so beautiful! I love the tornado flower stencil. 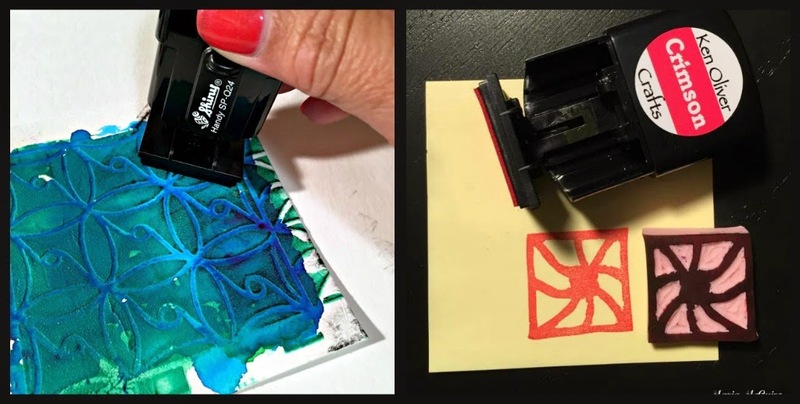 I envy you all the fun you had playing with these new colors and stamp pads. Both are new items to me and I can't wait to get to try them out. Thanks for the great ideas on using both of them. The finished project is beautiful and will look so great on display. I would be thrilled to have them in my living room. Maria, your running dialogue was adorable....I usually have those conversations with the Labrador at my house. Your process really gave me some inspiration....never know what to do with all the small pieces that I experiment upon. The canvas is a great idea....all sorts of ideas swirling now. Thank you!! These are fantastic projects. Thanks for the clear directions and photos. Oh my I just want to get my hands on the color burst so I can play and create. Love all that can be done with them. 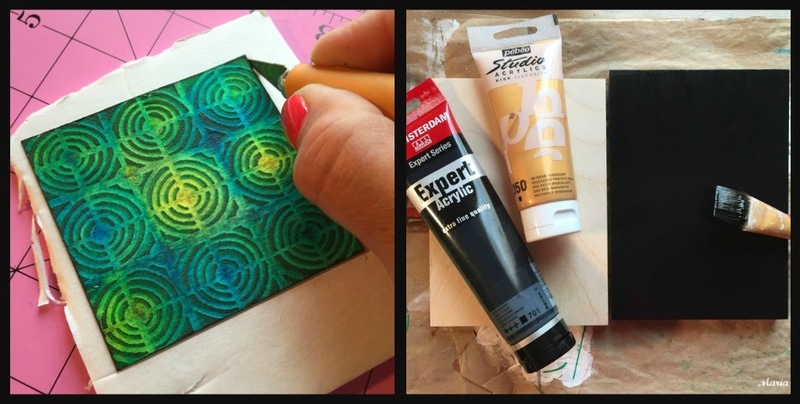 Love this project, and I love your stencils! This is a great hop -- so much talent, and the fun of seeing what Color Bursts and molding paste can do! Your artwork is gorgeous, Maria! Lovely yummy colors. Love it! OMGosh~!! I would have LOVED to be at your place! LOL!! Can't believe just a very little bit of Color Burst made that molding paste so vibrant - really?! WOW! Loved what you came up with! 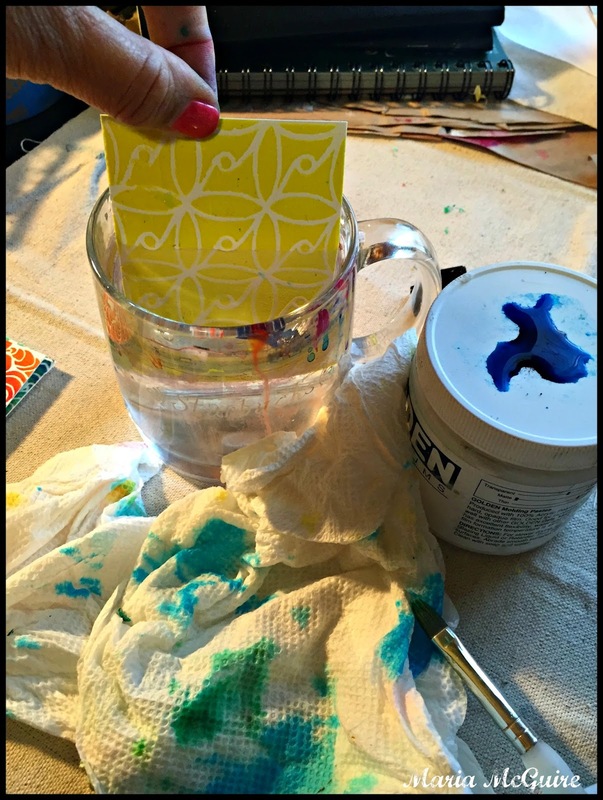 Mixing Color Burst with molding paste is a great idea! Thanks for sharing! Loose and free with lots of color! That's how I roll, too:) I've got to get my hands on that Color Burst and those ink stamp pads! Too cool. Thanks for sharing your wonderful projects. Talk about hitting it out of the park!!! So many fabulous ideas from such a fab artist! Love the molding paste especially with the color bursts in between ~ gorgeous! Also, I am going to have to get your Doodle It Bigger stencil! 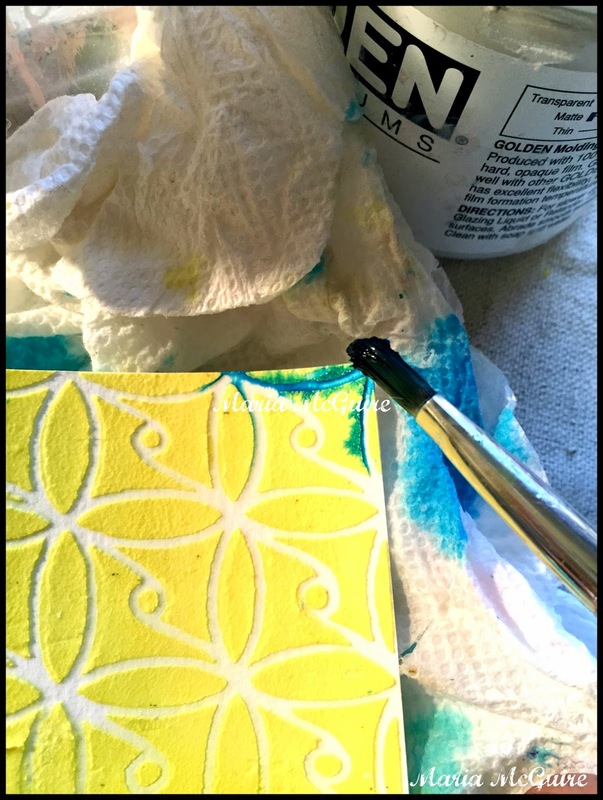 Love the use of Colorburst with the molding paste.. so great! this turned out so well. 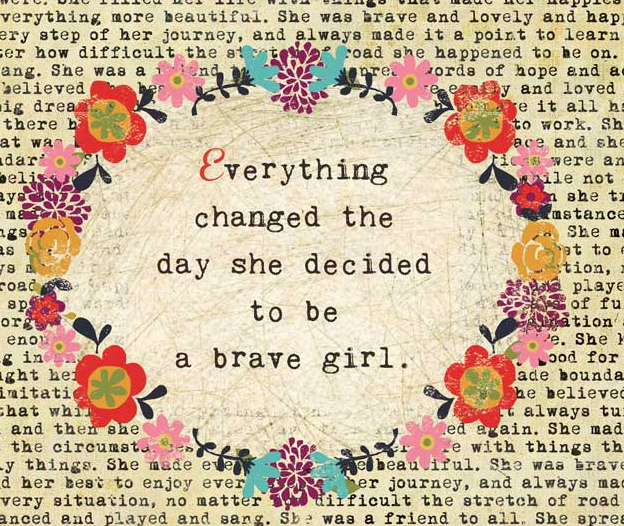 I'm learning from all of you, to be more daring and experiment more. Awesome project and tutorial. Pinning! Just love the way your pieces worked out! Will have to try working the product with the modeling paste! Wow! Using these with molding paste really creates some vibrant pieces. Nice to see what water did. love your crafting table Maria!! and after the dunking how the blue greens started to seep into the yellow! WOW! Loving your ideas :) Thanks! These techniques look like so much fun! BEAUTIFUL! Wish I could be there with you to get all that FUN inspiration. Love your Creative Mojo. OMG! Where do I even BEGIN?!?!?!? Your work blew my mind! It is STUNNING!!!! I just love this project! It's a must-try for sure! Just amazing!! Thank you for showing this technique! I don't know how you remembered to take progress photos! You were obviously in the zone! Absolutely fantastic look and those stencils are so cool. Great tutorial too. This looks so much fun! thanks. Very cool techniques . . . especially adding color over the top of the modeling paste on damp paper! Wow... it looks like you had tons of fun playing! It's great to know that color burst can be used for tinting pastes. The stencils and the color bursts play well together too... all so beautiful! I am so glad you got together w/ Ken. Perfect fun!!!! What fun it looks like you had! Color Bursts are so versatile! Maria what you did is awesome! I loved seeing all your ideas!! 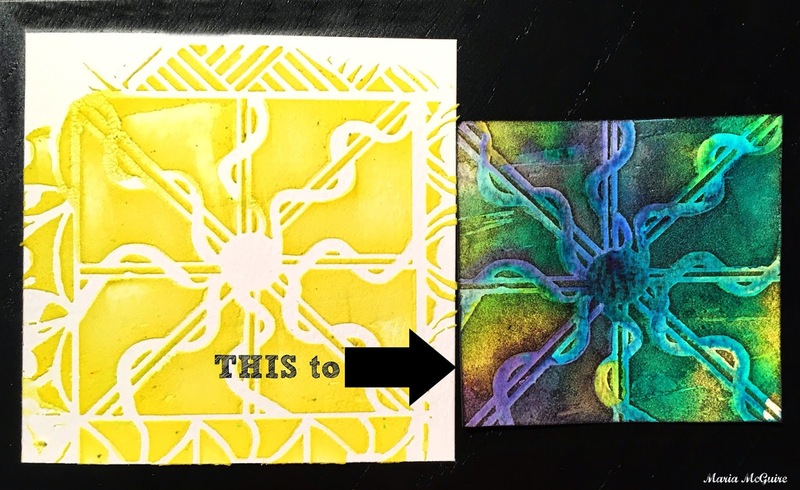 Another great idea for using Color Bursts with stencils but with a new twist - paste & texture. Thanks for the tutorial & mounting display instructions. I enjoy the different ways you created each piece. The colors are stunning. I'm so glad you did try with the molding paste! That is fantastic, and I love your wooden canvas'. the colors are amazing. Seriously girl! These are so gorgeous and intensely colorful. 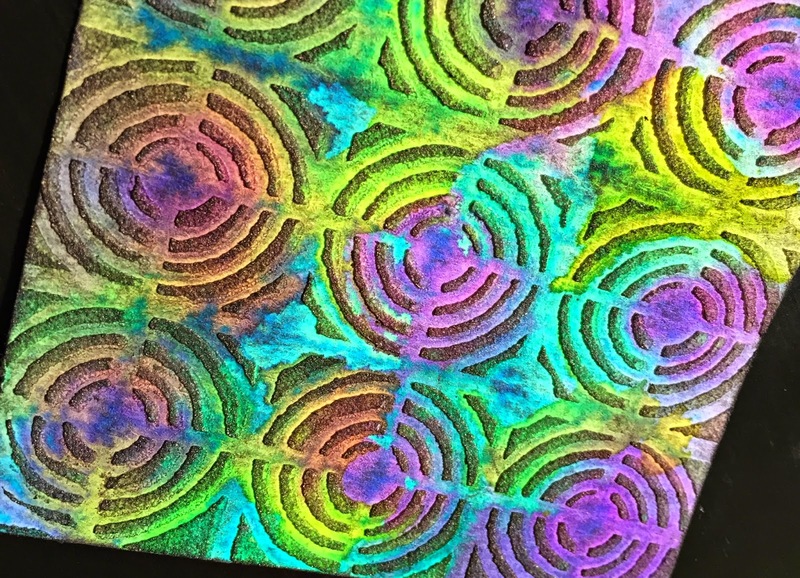 LOVE the tornado stencil with all that color. Great use of all! love the colors an concepts. 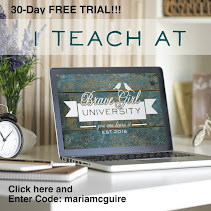 I really enjoyed the great tutorials this week using this product. Really beautiful and I can't wait to play with the product myself! what a fabulous way to use these! I would never had thought of dipping them!! the more i see, the more i think i need this product! Wow! These are eye candy popping! Amazingly beautiful. Thanks for sharing. LOVE these, so pretty, going to have to try this myself. Really inspiring, Maria! I found that Color Burst ids really good for staining your fingers, too--had blue and green fingers for hours after playing with some!